Oh my -- it's suddenly December and Christmas is just week's away! Now that it's December it's time for Advent Calendars! Golden Euro Casino’s Advent Calendar of Christmas casino bonuses begins giving daily free spins bonuses today and continues until Christmas Eve. The first prize revealed on the first day of the calendar is 17 free spins on the Penguin Power slot. over the next few weeks, there’ll be free spins on more of the casino’s most popular slots, like Panda Magic and the new Purrfect Pets. Christmas slots like Naughty or Nice and the brand new Swindle All the Way will also be featured. 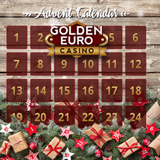 The Golden Euro Advent Calendar will give you a Free Spin Bonus on a different game every day up to Christmas Day. Each day a different game and a new bonus will be uncovered! To find out what the bonus is today, go to the online Advent Calendar or check the casino cashier. Daily prizes include free spins on Christmas slots.